f13.net | f13.net General Forums | General Discussion | TV | Topic: Marvel's Luke Cage 0 Members and 1 Guest are viewing this topic. He does look very Luke Cagish. So, like, why Luke Cage? What's he got that fits a Netflix or ABC series? He's the husband of Jessica Jones. Right. Except I'm as ignorant of "husband of Jessica Jones" as I am of "wife of Luke Cage"
Got excited when I saw a connection between "Jessica Jones" and "Alias" by way of wikis. But it was the wrong "Alias". I've been trying to find the simple why-I-should-care synopsus of either Luke or Jessica, but I'm only running into all the usual secondary characters comic meandering history stuff. Which I assume means I'm missing something. The feeling I get from interviews and such is that Marvel is so successful, they can do anything they want. So it's kind of become this weird studio of comic book geeks all laying on the living room floor scattered with back issues reading obscure titles and going "Wouldn't a Luke Cage series be freaking cool?" Then they get a whole bunch of money and networks beg to air their shows. It's actually kind of scary and I suspect it's going to collapse and explode in some spectacular way. Luke Cage is a long standing B (second tier) character. He has been in a bunch of series and has a lot of history. In recent years, his popularity has been on the rise. I'd call him just a nip behind Daredevil in popularity from comic fans. Jessica Jones is a more recent invention, but she has a strong following based upon the 'adult' nature of her story. Both characters fit into the idea of a 'street level' (as opposed to world saving) group of heroes that can have more adult storylines than MAoS or Avengers. It is a chance to expand the brand and do stories that are more like Alien than Star Wars, or more like Bale's Batman than Keaton's. That's kinda like wondering why you should care about Guardians of the Galaxy if you didn't know any of the characters. Ultimately the comics don't matter, these things live or die based on their own quality and we won't really get an idea of that until they start showing some previews of these shows. I don't think they've even announced a Daredevil release date other than 2015 yet, and apparently they just finished filming the last episode of that within the last couple days. Yeah, the test for Marvel is going to be when they have money invested in something that just doesn't work. Will they kill it to protect the franchise as a whole, or will they risk it, inevitably have something bomb hard, and send them into the usual over controlled death spiral? They need to take creative chances, but not double down on the bad risks. The Netflix stuff seems to be their trial balloon for that, someplace they can safely screw up. Funny you should say that, because that's EXACTLY what I was wondering when GotG was first announced. "So lemme see, Fantastic Four, Avengers, Thor, Captain America, Spiderman, and.... space raccoon? What the what?!" jgsugden's explanation makes more sense to me: martial skills from normall people doing extraordinary things. Bale's Batman or even Arrow, or even to a degree the Steel version of Man of Steel (whoever that ironworker was, Henry-something I think), or Daredevil. Sounds like Cage has a following and doesn't require crazy special effects, so now I think I get it. Nope. Jessica Jones and Luke Cage both have super powers. Luke is in fact near the top of the power curve as far as Marvel goes isn't he? Why does he need healing if his skin is unbreakable? He sounds phoned in. They've upped his power level just a bit since the '80's. He used to be a real low level type of power - the Marvel Universe books listed him as able to lift about 2 tons (Hulk by comparison was at least 100 tons and more the madder he got). Bendis used him in his Avengers runs and made him a lot stronger than that. He's equivalent to She-Hulk at least, and actually may be even more damage resistant now. Strength and damage resistance are fairly easy to show on a reasonable budget though. Jessica Jones can fly also, but I guess we'll see if she does on the show. With Daredevil I guess it depends on how they show his heightened senses. Iron Fist probably needs good fight choreography more than high budget special effects. Glowy fists aren't hard to cgi! Originally he was essentially a junior-version Hulk, another "supersoldier serum" experiment. Not nearly as strong, but not a barely-sentient rage monster, either. Only thing he shared in full measure was indestructibility, which was the gateway to his powering up. In various versions, he has been incredibly powerful (in one he was a cannibalistic zombie that eventually ate Galactus). I think we'll see something closer to plain vanilla origin Cage for this, maybe 10 times stronger than a normally strong man, hard to hurt but impossible to kill. That leading to powering up to something closer to Avengers levels will probably be the overall arc. These are netflix series so expect them to have a decent budget. Jessica Jones doesn't make quite as much sense in the Marvel Cinematic Universe as she did in the comics. In the comics, she was a woman with super-strength and invulnerability who did what you're supposed to do when you get those things, and that's put on a skin-tight costume and act like a superhero. She wasn't very good at it, felt uncomfortable doing it, and then got mind-controlled by a creepy supervillain who used his powers the way people in the real world would use mind-control powers--and people who got mind-controlled felt the same way we would about being made to do things against our will. So she quit trying to be a superhero, developed a drinking problem and struggled with depression, and become a private detective whose cases typically entangle her in superhero business. I think that's what you're going to get in her series--take away the backstory of trying to wear spandex and failing and just go straight to "superpowered detective with a self-destructive personality". 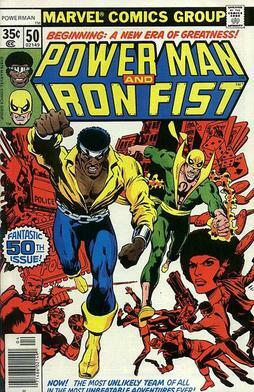 Luke Cage was originally a blaxploitation character--think Shaft with super-strength and invulnerability. He teamed up with a martial-arts character who was created to imitate Bruce Lee, so basically two B-movie genres mashed together. If Marvel really felt gutsy, what they'd do is get Quentin Tarantino to be exec producer on any series focused Cage and his buddy Iron Fist--that's the sensibility that would capture the characters best, in many ways. Can't get that link to work at all. I take it you never read Power Man and Iron Fist, then? I had a couple of issues, though to be honest, I'm not sure why? Maybe they were given to me before I started collecting comics "properly" back in the day. Perhaps it's also to expand the racial character base of Marvel's series, since Ultimate Fury seems to be the only black guy so far? They've been around for a long time though. Heroes for Hire was a fun comic series. Luke Cage is also an Avenger. Cage and Iron Fist are actually in the Ultimate Spider-Man cartoon going on right now as well. At this point, hasn't everyone been an Avenger? Like, I understand that both Spidey and Wolverine have been Avengers since I stopped reading. I know Beast was. Any other X-Men? Daredevil? Daredevil has been an Avenger, yeah. Everyone has been now. Dr. Strange has been! I think it's honestly a bit about making sure that Marvel has a possible claim to almost all of their characters if they choose to push it. The recent Sony leaks showed how detailed the discussions on character rights go. They're very detailed. When they've clarified the rights to a unpowered villain that appeared in one issue of a Spider-man comic (which would clearly seem to fall with Sony), you know they've locked up all the A, B, C and D tier characters (hero and villain). I'm still genuinely shocked they introduced inhumans on MAOS with a movie coming up. Ususally cross pollination like that is the realm of actual comics and generally does not work well in other mediums but I'm sure marvel has so much clout now they can try just about any idea to see if it works. As for luke cage's origin, why bother changing it at all? Cage is given a variant of captain america's super soldier serum and his powers are nearly identical to caps. It would seem unnecessary to actually change his origin since it already fits perfectly into the cinematic universe. I agree, they'd be better suited to going with a variation of the super-soldier serum than trying to make Cage an Inhuman. Of course, that could also depend on what they plan on using to explain the Scarlet Witch and Quicksilver in Age of Ultron. I'm not surprised that they introduced the Inhumans on the TV show as opposed to waiting for the movie. Why not? Even if you never introduce the bigger elements like Attilan or any of the Royal Family, you still get some name recognition in the public for a group that has NONE among non-comic book geeks. It gives the TV show somewhere to go, and even if they cancel the show before the movie comes out, you haven't really hurt the movie brand at all. I've got that entire run (of like 19 issues, heh) of that comic in my spare bedroom. Good run drawn by my onetime favorite artist John Byrne. Though I liked Iron Fist better than Luke Cage. I think they may set up Inhumans on MAoS, but I think the most they'd do is borrow from the Crystal or Medusa origin stories and have one Inhuman from the movie franchise on a TV show. I'm pretty sure that the idea of the Inhumans in general is a way for the Marvel Cinematic Universe to have "mutants" without having to call them that. It also fits a bit with the way the comics themselves have made a ton of new Inhumans that were offshoots of the original Inhumans, who didn't even know they had the genetic markers that are enabled by the Terrigen mists.